Our Queens are Beautiful and are Excellent Mothers! 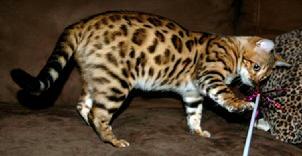 At Santa Fe Bengal Cattery, we have chosen to become a very small Cattery. We prefer to have only the number of Cats that can be well cared for and individually loved. A smaller number of producing Queens results in healthier, happier, well-adjusted and social Kittens. We also move ahead with our breeding program quickly and do not over-breed our Queens... they deserve to have a happy House Cat life for most of their lives. A larger Cattery having eight, ten, twelve or more Queens is a commercial Cattery and conditions, and attention given to each Cat, can become stressed and minimal. Having knowledge always helps to make decisions easier. And this is why we have taken the time to create an educational website... so that your choice is easy. We strive for quality... not for quantity. We absolutely LOVE her! 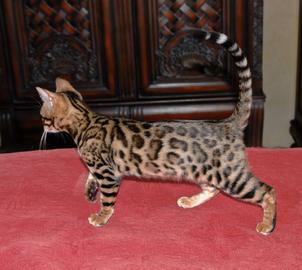 Thank you Lydia and Don Wright, TheRealms Bengals, for this spectacular girl. She is young in these photos, but has grown up beautifully and has had her first two litters. More photos and informatuion to be posted about her soon... but these early, quick photos really do say it all! Just look at those whisker pads!!! More Kittens from Zenvi soon! Check out our Snow girl! Among her other show quality attributes of rosetting, small ears and a perfect head and full conformation, she has the most spectaculatr tail: short, very thick, and perfectly striped. This is Snow White and she is ready to have her first litter of Kittens. She is young in these photos... more photos soon. We are proud to say that her father is our own Isosceles, so she is be paired with our BST boy, Genghis... we anticipate top-quality Rosetted BST and Snow Kittens. Introducing our newest girl... She is ulterly fantastic and we are proud to be able to have here here at our Cattery. We are still considering what her name will be. This is Foundation - Early Generation, F1, Maita'i Roa Ae. Her name is Tahitian and means "Out of this world - the very best" and she is just that! Our girl is young and will soon becoming ready for her first litter of Kittens. Mai ta'i has not proven to be able to breed and we have removed her from our breeding program. Unique Prints Maitai Roa Ae of Santa Fe Bengal is unfortunately not capable of breeding. We are hoping to have her replaced by the breeder and want a happy house Cat life for this sweet girl. 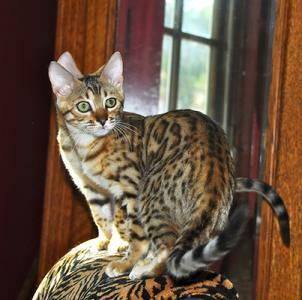 Meet, Cleopatra of SantaFeBengal... she has the Leopard-coloring that we love and a clear pelt with large, crisp rosettes. Cleo's mother is a Rosetted Seal Mink Snow Bengal, so she carries the Snow Leopard gentics... that means that she also had gorgeous Snow Leopard Kittens!!! She has had Show Quality Kittens and we have loved having this spectacular girl here with us. But... it is Cleo's turn to be a happy house Cat at five years of age. This beautiful girl is now retired. We are very happy that one of our two time Kitten owners has selected her and she is living happily in Kentucky with Brook. We miss her, but her happiness is what is most important to us. Cleopatra... no, you are not seeing double... that is Cleo's brother, "LB," behind her on the bench. Pardon the slightly out of focus photo... but it is an action shot and isn't Cleo beautiful!? This is SantaFeBengal Snow n Isis, we called her "Snowy," as a Kitten and she is our beautiful, Rosetted Seal Mink Snow Queen... The only thing better than her beautiful rosetted markings and lovely Snow Leopard attributes is her ultra friendly and loving personality. Unfortunately, Isis had an issue after her last litter and we had to have our Vet perform an emergency spaying. So, Isis is now retired and a happy house Cat. 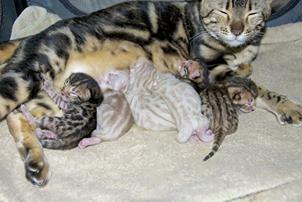 Click HERE to see photos of some of her Kittens... you will be wowed! Isis is the sweetest girl... but in this photo she is saying, "ok, ENOUGH PHOTOS... my Kitten needs his nap!" It is her turn to be a house Cat, so we have retired Marley and she has been selected... Thank you Sarah for giving Marley... and a Kitten... such a wonderful new home! 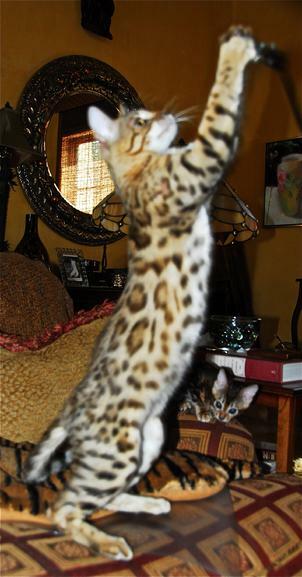 SantaFeBengal Fire's Ember, has been an excellent addition to our Breeding Program. This is Fire's baby and the father is Romeo. 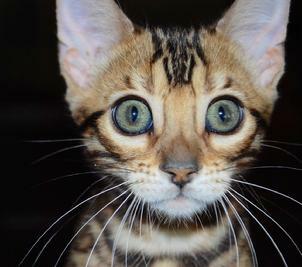 This entire litter was spectacular, but this little girl has everything that a Bengal Queen should have and we just had to keep her. She has clear rosettes with intense high contrast and a lot of honey red background coloring. Click HERE for more photos of Ember. Our beautiful Ember has graduated to retired status and is a very happy house Cat. 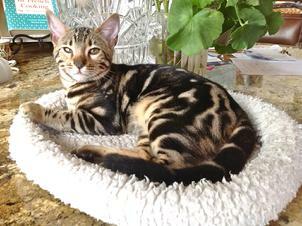 Santa Fe Bengal Cattery's beautiful young queen, Fire's Ember!! "OfEiffel Proportion" as a Kitten... we call her "Effie." 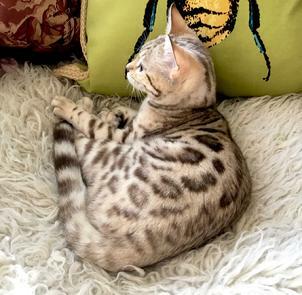 SantaFeBengal OfEiffel Proportion... she has been our first F3 to keep as one of our Queens and Effie has the Leopard-coloring that we love as well as a clear pelt with ALC rosettes. We are pleased with how she has developed - her face and conformation are amazing! Despite Effie having some very beautiful Kittens, we have decided to retire her. 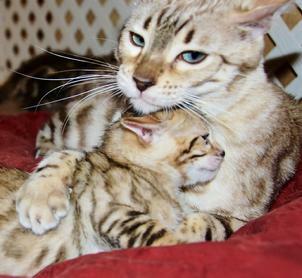 She is a very special girl, very loving - we adore her - and she is a wonderful, loving, wild-looking, F3 Bengal, house Cat. Up close view of a F3 Kitten's HUGE rosettes! WOW!!! 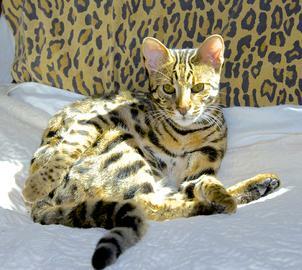 This young Queen was born right here at Santa Fe Bengal Cattery! "SantaFeBengal Charcoal Bear" is a F2 Kitten, who is just too good to be true! We had to keep her. 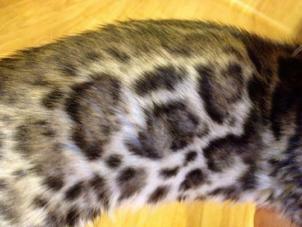 The Charcoal color comes from the ALC - this coloration is usually only in Foundation Cats - very special! She was born completely black, like a little bear cub, and slowly evolved into the beautiful charcoal rosetted pelted girl that she is. Charcoal is an ALC coloration and an example can be found on our Foundations page at the top. 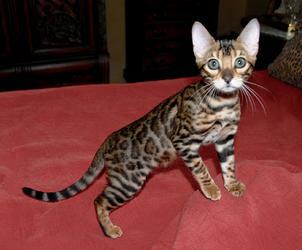 It is not Silver - "SST" Bengal coloration - which comes from American silver short-hair tabby bloodline. Charcoal is much rarer, a natural Bengal color, and is much more special than Silver. After having single Kitten litters, and keeping two Kittens, we have decided to retire Charcoal Bear... she really wants to be with her humans all of the time, so she is now spayed and is a very happy house Cat. Click HERE for more photos of BEAR. UniquePrint Prima of SantaFeBengal was one of our beautiful Queens. 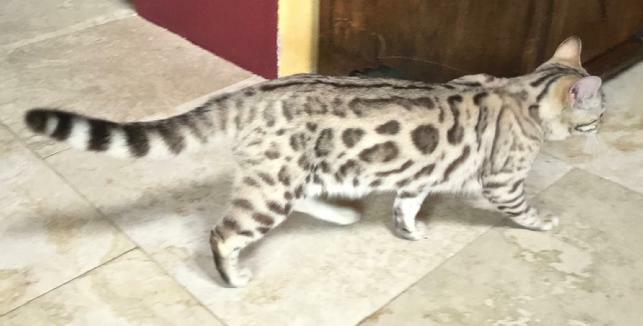 She is an F1 Foundation Bengal and her Asian Leopard Cat Sire is shown on our Foundation Cats page and there are also more photos of our beautiful girl. Prima is retired. 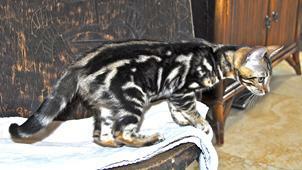 Click HERE to view Prima as a Kitten. Click HERE to view photos of Prima's Sire and Dam and to see her full pedigree. 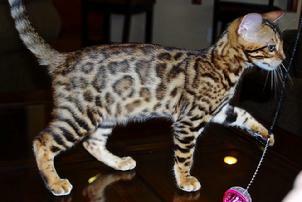 This lovely F2 Queen was born right here at Santa Fe Bengal Cattery! "SantaFeBengal Tarija" is a Foundation F2 Bengal, who is a lovely example of the rufoused coloration. Tarija is named after an Ocelot, who I once knew! In this photo she is still a teenager, but has since grown up...and has given us some wonderful Kittens, including "Effie". She has a very sweet and playful personality and is now spayed and retired. She has been one of our House Cats and we love her very much, but we let Tarija and her daughter go home with the perfect new owners! Thanks, Liza!! 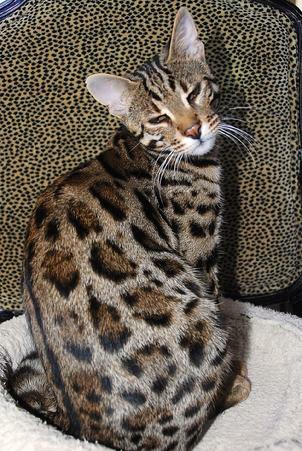 This is one of our most beautiful Queens, her name is Kajari Sapphire Nights of SantaFeBengal, or "Fire", and she has added a lot of zest to our Breeding Program. Fire is HCM and PKD negative. She has provided us with some of our best Kittens and we have, happily, kept one of her daughters... and it is a good thing, as she has unfortuately had a serve pyometra that we could not correct with medications and has had an emergency spaying to save her life July 2012. She is a happy, healthy "Pet" and is retired... Fire is now owned by Brenda and lives in North Carolina with one of her beautiful Kittens from one of her litters! Thank you so much for giving our girl the best of homes!! Click HERE to see more photos of Fire and to see her Kitten photos. Click HERE to see photos of her Sire and to see her full pedigree. 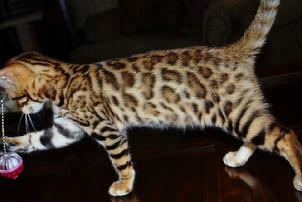 SANTA FE BENGAL BODACIOUS BELLE has beautiful markings and a lovely rufoused (red) coloring. She has provided us with two of our best Stud Cats! 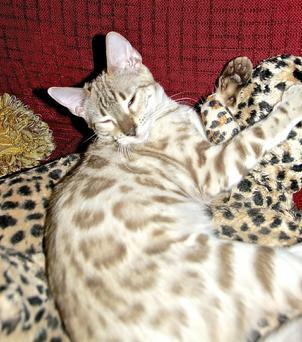 SantaFeBengal Bodacious Belle has looks that are fantastic and she has a personality to match. She has wonderful honey red coloring and beautiful green eyes. She always greets us with the distinctive "Bengal Bark." She has been bred with "Studman" and produced show stopping Kittens -- the traits of both parents are passed on and then intensified. Her litters have all been amazing, but she has been given the gift of retirement. Bodacious Belle has joined her mate, Studman, and now lives in Boulder., CO with Encarnita. Thank you so much for giving one of our favorite girls such a happy House Cat life with you and her handsome mate, Studman!!! We miss her, but are glad that she is so happy! !